"Use less pepperoni if you don't want it too spicy." Heat a large skillet over medium-high heat. 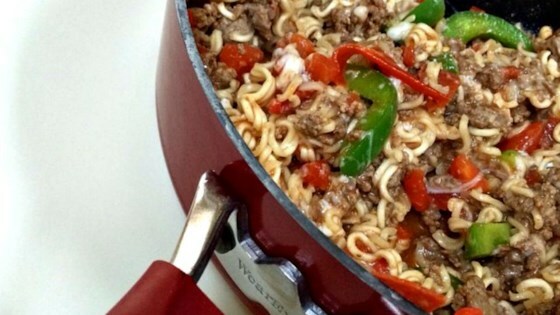 Cook and stir beef and pepperoni slices in the hot skillet until beef is completely browned, 5 to 7 minutes. Stir tomatoes, water, and the seasoning packet contents from the ramen noodles into the beef mixture. Break ramen noodle blocks into halves and add to beef mixture with the green bell pepper; cook until the noodles soften, about 5 minutes. Remove skillet from heat, sprinkle mozzarella cheese over the beef mixture, and place a cover on the skillet; let mixture sit until cheese melts, 2 to 3 minutes. This is also good with Oriental-flavor ramen. Husband loved it. Made 1/2 recipe for him. Made this on a camping trip and it was easy a delicious. I cooked the green peeper with the meat and would recommend dicing it instead of leaving it as strips.